How do you know when you're really a RUNNER? I'm still basking in the glory of my recent marathon, so this past weekend, as an act of reflection, I went back through all my old blog posts tagged "running." I think it's important to remember your past as it helps shape your future, you know? Sometimes looking back can help you answer questions you have now. So what did I learn? I learned that I tend to aim high, but I lack the follow-through. I read a lot of sentences that were like, "I didn't train very well" (or at all), or "I didn't do as well as I would've liked," or "I should've done x better." Or "I should've tried harder." I read lots of regret for not pushing myself more. Part of that is me not actually trying hard enough, and part of it is me never thinking anything I do is good enough. On the other hand, I also read a lot of triumphs and break-throughs, not just in terms of time, but also in terms of mentality - I did stop beating up on myself so much. I started listening to my body more. And especially these past six months, I started focusing more and being more disciplined. My blog doesn't tell my whole story, and I'm sure my training log could fill in a lot more details, and I looked through my history there too. (I also keep a physical notebook where I just write down the date, the time, and the distance.) It's not surprising that, though I had run more races in 2013 than in 2014 (and ran the same number of races in 2012 as in 2014), I really felt more like a runner this year, especially these last six months, than I ever have before. So what accounted for the difference? What was the change that really made me feel like a runner? For me, it was not the races themselves, but the all the other runs. I don't have access to the numbers right now, but I can pretty much say that I put in more non-race mileage this year than I have in any other year, even though this was not my first time training for a marathon. 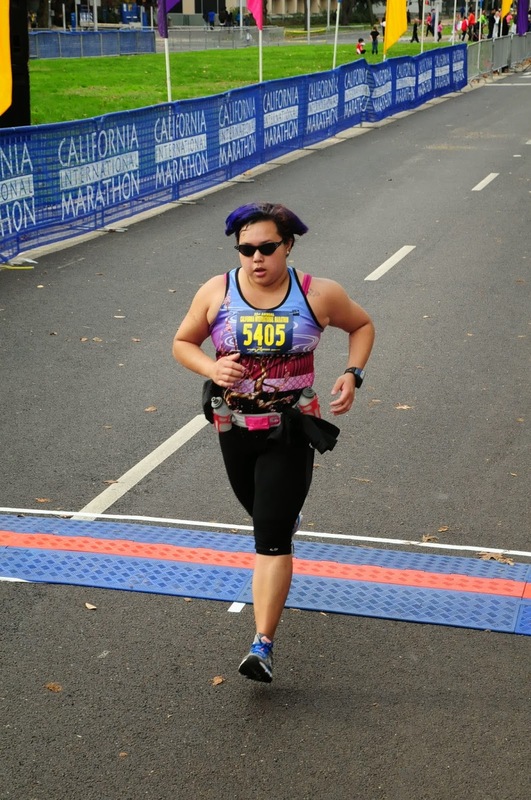 What made me feel like a runner? Running consistently and loving it. I've mentioned many times to friends this year how I've actually grown to LOVE the act of running. Some people only love running once they've stopped running, but I actually feel really happy and childlike when I run. I've been running races for over a decade, but it wasn't until this year that I actually grew to enjoy running and to crave running when I couldn't run. I made running a priority this year because I really, truly learned to embrace it as a passion and really make it a part of my life. It's not the fact that I've run marathons, and it's definitely not my pace, that makes me a runner. I'm a runner because I run - because I want to run. That's not to say that I never feel tired or that squeezing in a training run during a really busy week doesn't feel like a chore at times - I'm only human after all. But for the most part, I now spend my time wondering not if I'll run, but when, and the idea of skipping a planned run just feels awful to me and I am filled with regret - not out of guilt or self-admonishment, but out of longing. These days, when I can't run (either because I'm busy, or because I'm actually recovering from a run) and I see other runners outside, I actually feel envious! I'm a runner because I've made running a cherished part of my life. I'm a runner, not because of the races I choose to run, but because I choose to run, period.